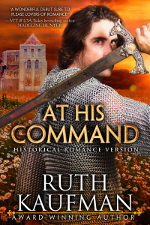 For this week’s Medieval Romance Monday we are featuring At His Command, the new medieval romance novel by Ruth Kaufman. 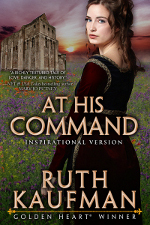 Ruth Kaufman may be the first author to release two versions of her medieval AT HIS COMMAND to meet readers’ differing needs. One version is mild/sweet and inspirational, with a faith element, features the heroine on the cover. The other features the hero on the cover and has some love scenes but no faith element. Which will you choose? In AT HIS COMMAND, King Henry VI sends Sir Nicholas Gray to protect recent widow Lady Amice Winfield from undesirable suitors. At court, the king orders her remarry the lord he and the queen choose. Can she find a way to defy the king’s command because she’s falling in love with Sir Nicholas even though they serve opposing factions? Click on either cover to read more about each version. This entry was posted in Medieval Romance Monday and tagged medieval romance monday, ruth kaufman. Bookmark the permalink.